Through a series of missteps and outright neglect, Microsoft essentially handed over the fate of its web browser – and its ability to shape the online world – to rival Chrome. The white flag of surrender was raised this month. Microsoft's announcement earlier this month that it was dumping its own browser technology for Google's - turning Edge into a Chrome clone - was a stunning acknowledgement that the company had lost its decades-long battle for browser supremacy. "We intend to adopt the Chromium open-source project ... to create better web compatibility for our customers and less fragmentation of the web for all web developers," Joe Belfiore, a corporate vice president in the Windows group, wrote in a Dec. 6 post to a company blog. But while Belfiore blew the open-source horn, he didn't bother to recap how Microsoft reached this point when earlier in the century, it was the dominant browser maker, accounting for more than 90% of all usage after it laid waste to Netscape Navigator. Microsoft's fall was long but never inevitable. Mistakes, as they say, were made. We identified six that contributed to the decline of Redmond's browser empire. Although Google updated Chrome every six to eight weeks from the browser's 2008 inception - and Mozilla accelerated Firefox's pace to every six weeks beginning in 2011 - Microsoft stuck with a glacial cadence. Internet Explorer received new features only with new major releases, which were separated by as many as five years (IE5 to IE6) and as few as one (IE10 to IE11). In the 10 years since Chrome's debut - a span during which Google revamped the browser 70 times - Microsoft refreshed IE just four times (IE8 through IE11). Even Edge, which Microsoft trumpeted as its "modern" browser, advanced at a torpid pace. At its speediest, that tempo meant Microsoft added new features to Edge only every six months. While cheetah-like compared to IE, Edge was a tortoise to Chrome's and Firefox's hares. At one point, reports surfaced that Microsoft would sever the upgrade ties between Windows 10 and Edge so the latter could be updated more frequently. The separate schedule for Edge was to kick off in the fall of 2017. Microsoft called it quits on IE with version 11, the one included with Windows 10. From 10's mid-2015 debut, IE was maintained, yes, with security fixes, but new features? Not a chance. Instead, the company devoted all its browser-building resources to Edge. That meant Microsoft abandoned almost all of its customers to the competition. At the beginning of 2016, about 89% of all Windows PCs ran Windows XP, Vista, 7, 8 or 8.1. Nearly 9 out of every 10 Windows machines, then, looked at a dead-man-walking browser if they ran IE. With IE in stasis, and Chrome and Firefox upgrading seven or eight times annually, it's no surprise that users deserted IE for something fresher. The decision that Edge would run only on Windows 10 - marking a clean break with Microsoft's browser legacy - was the essence of hubris. Clearly, Microsoft expected customers to adopt Windows 10 in droves, many more and far faster than any previous upgrade. The likely explanation for the anticipated rush: Microsoft gave away Windows 10 for 12 months. The brash goal of 1 billion Windows 10 devices within two to three years of release - by mid-2018 at the latest - was evidence of that reasoning. With install numbers like that, a billion when the world's PC count was 1.5 billion, and the not-yet-understood-to-be-obsolete idea that a default browser would always win, it's easy to understand why Microsoft had very high hopes for Edge. Microsoft anticipated that IE's losses - it had to figure the upgrade-or-else mandate would cost it some users - would be made up for, or nearly so, by Edge's quick climb. Even with aggressive tactics to keep Edge the default - it was much harder to make a rival the primary browser in Windows 10 than it had been in earlier versions of the OS, for instance - the browser never managed to attract more than a bit over a third of all Windows 10 users. By November 2018, that figure was down to just 11%. That's a historic repudiation of a default browser. While some of that rejection was due to Chrome's gravitational pull - that browser grabbed nearly a third of all user share by the end of 2015, then kept climbing - Edge's own failings also played a part. Top of the missing-feature list: Edge lacked support for add-ons of any kind at debut, a forehead-slapping omission. Microsoft itself acknowledged an even greater failing when it announced it would ditch the home-grown EdgeHTML rendering engine for Blink, which comes out of the Chromium open-source project and powers Chrome. "People using Microsoft Edge (once based on Chromium) will experience improved compatibility with all web sites," Microsoft said in the blog post that publicized the decision (emphasis added). EdgeHTML, in part because of its lackadaisical upgrade cadence, was rarely able to catch up, or if it did, maintain equality, with Chrome in properly rendering pages or rendering them at speed. As Chrome climbed in usage, sites were built or revamped to best work in Chromium, just as early in the century sites had been designed with IE6 in mind. Edge never shed a reputation of balking at loading pages or displaying them as intended. By going "full-Chromium," Microsoft will make Edge's compatibility problem moot by, perhaps, the end of 2019. Computerworld has maintained that Microsoft's errors preceded Edge, that the company threw away a large part of its browser strength nearly a year before Windows 10's launch. In August 2014, Microsoft said it would slash support for IE by demanding that Windows users upgrade to the most-recent version of the browser fit for their OS. The order scratched a year of support from IE7, four years from IE8 and IE9, and seven years from IE10. (At the time, IE8 was the most popular version of the browser.) Only IE11 survived with support intact. The ruling was unprecedented; no browser maker had ever commanded users to abandon a browser with support still owed them. But if Microsoft expected a sudden uptake of IE11, it was soon disappointed. 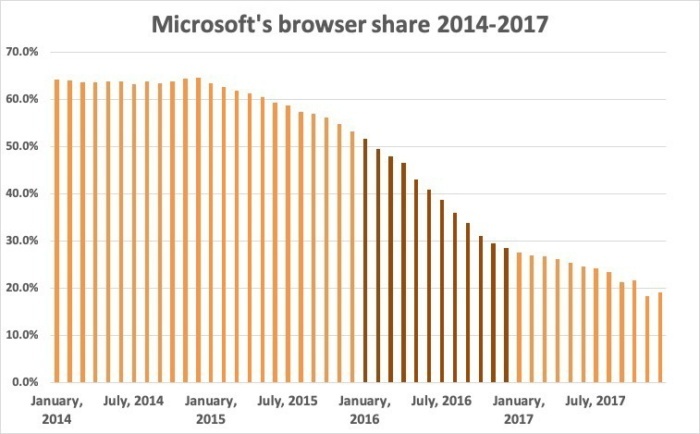 After the mandate went into effect in January 2016 - when 53% of all those running a Microsoft browser were forced to switch - a stunning decline in user share began. During 2016, Microsoft's global browser share plunged by more than half. And rather than swell its user share, IE11 shed more than 30% in the first nine months of that year. It's always very difficult to prove a counter-factual - what would have happened if Microsoft had not forced over half of IE's users to give up their preferred browser? - but there seems a causal link between the order and IE's frenzied decline. Told that they had to switch browsers in any case, a huge portion of users decided that they might as well switch to Chrome, at the time IE's biggest rival, as change what version of IE they had, or worse, their edition of Windows. In November 2018, Chrome lorded over all other mobile browsers. According to analytics vendor Net Applications, 62% of the global mobile browser user share belonged to Google's browser. (Another 1% was owned by the aged Android browser.) Apple's Safari had 29%, thanks to the iPhone and iPad. The third-place mobile browser? Firefox, with less than 2%. Meanwhile, Microsoft's various browsers accounted for just a sliver of mobile: six-tenths of one percent, a number so small it fit within Chrome's rounding. None of those numbers are even mildly surprising. Chrome desktop benefits from its cross-platform popularity on mobile (where it's a required factory install on Android handsets if the Play Store is to be included); Safari would be even more of an afterthought on desktop if it wasn't the default on iOS. And Microsoft fumbled its foray into mobile, thus losing any support its desktop browsers might have derived from the smartphone side. After writing off billions of dollars because of the Nokia disaster, Microsoft has steered clear of phones, playing only in the tablet/hybrid market. If things had turned out differently, it's possible that Edge would own enough combined desktop-mobile market share that developers would be forced to craft sites to suit it, which in turn would ensure Edge's survival as a distinct browser. That might have occurred in a different timeline, but not this one.